The ongoing political dispute between Qatar and those who boycotted it – principally Saudi Arabia, Egypt, and the UAE – resulted in a concerted campaign to boycott Qatar commercially as well. One of the casualties was Qatar-headquartered beIN and its premium sports services, for which it had paid huge sums of money for exclusive MENA-wide broadcasting rights. The boycott left a huge vacuum for sports broadcast in Saudi Arabia, Egypt, and the UAE. Although the UAE relented somewhat by allowing IPTV opcos Etisalat and Du to resell beIN packages, the campaign against beIN was sustained in Saudi Arabia and Egypt. The first serious indicator as to what would fill this vacuum was the 2018 FIFA World Cup. A streaming service by the name of “BeoutQ” – on the back of social media fanfare in Saudi Arabia – appeared, providing access to premium beIN channels for a nominal fee. In a last-ditch attempt to keep viewers distracted from BeoutQ, the Qatari company was forced to change its FIFA World Cup 2018 distribution strategy and air matches for free to viewers in Saudi Arabia and Egypt. In the interim, BeoutQ became available on set-top boxes. Since then, these boxes have flooded Saudi Arabia and, by extension, neighbouring markets. What was a case of online piracy has become a sophisticated effort to undermine the pay-TV industry in the region. Virtually every major sporting body and organisation with content broadcast by beIN has come out in protest against BeoutQ’s unauthorised distribution. Legal measures have been taken at the WTO to tackle BeoutQ, with beIN initiating a US$1 billion lawsuit against Saudi Arabia, who it claims are the institutional backers of BeoutQ. 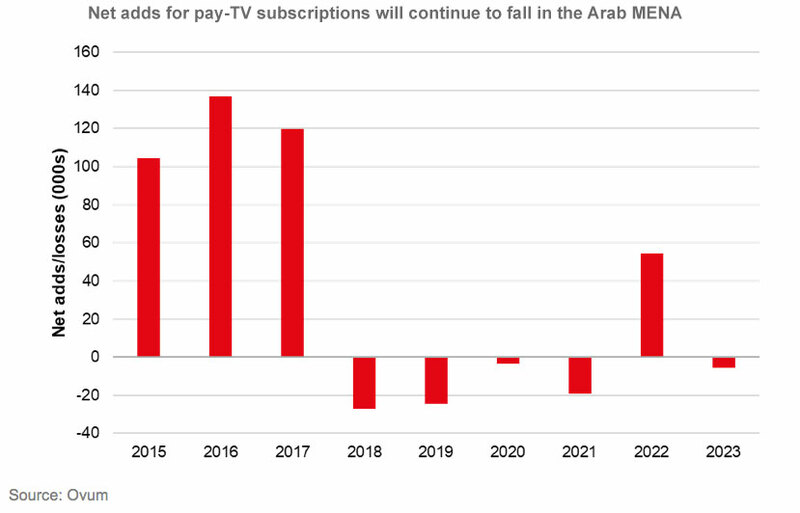 MENA’s pay TV forecasts have been revised downwards to reflect the impact BeoutQ is expected to have. BeoutQ is a relatively cheap service at around $100 per year for a full roster of beIN’s premium sports channels. As a result, growth there is set to contract in premium sports services over the coming years – except in 2022 when regional interest is likely to be heightened by Qatar hosting the FIFA World Cup (see Figure 1, right). It isn’t only sports rights that are being affected. KIPCO, the majority shareholder in Kuwaiti-headquartered OSN (MENA’s pay-TV incumbent for entertainment), is set on selling its stake in the company following poor performance. It blames this disappointing performance on – among other things – piracy from BeoutQ, which now also carries entertainment channels, traditionally the regional mainstay of OSN. 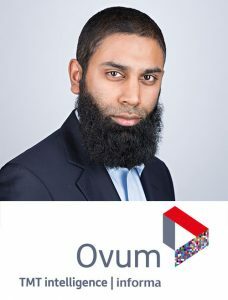 This case of regional piracy is now threatening to morph into a global issue, raising the stakes substantially, as BeoutQ-enabled boxes are finding their way to Europe and America. Both NBC Universal and Eleven Sports (a streaming service that last year won a swathe of sporting rights across European markets, including top-flight soccer) have complained because their broadcasts are being distributed by BeoutQ. Prominent broadcasting organisations like Sky and the BBC have lined up to condemn the outfit. BeIN is sustaining existential pressure on its business, with heavy subscriber losses in its key markets of Saudi Arabia and Egypt, at a time when pay TV is under pressure from streaming platforms and cheaper alternatives. As a result, it is possible that beIN will restructure its businesses and reorient its strategy for future growth. BeoutQ jeopardises investments by content licensees, which will impact valuations in future rights deals. Content investment across the region is likely to be constrained as a result. Rights will no longer be sold en bloc to the Arab MENA region. In any fragmentation of rights packaging across the region, Saudi players like STC and other pay-TV distributors will bid for the separate packages on a national basis when beIN’s rights to individual sports events expire. Until then legal battles and counterclaims are likely to characterise MENA’s pay-TV landscape. BeoutQ’s model has not only normalised piracy, it is a tool in the political campaign against Qatar. Ironically, this attitude to piracy might come back to bite future Saudi/Egyptian rights owners of sports events. In conjunction with anti-piracy and security vendors, Western broadcasters and major global sporting brands will intensify their efforts to curb the impact of BeoutQ on their services, and there will be further collaboration by them to counter this threat. Ismail Patel is senior analyst, media and entertainment at Ovum.